All Our Family Ancestry and History in One Convenient Location. All our Family Tree information is included on CD. It represents an updated and expanded version of the 1975 Diehl Red Book, "Genealogy of the Descendants of Samuel Diehl and Margaretha Ritchey, his wife (1740-1828)". Prior to 1975, this publication had only been revised twice before, once in 1891 and again in 1915. Also included within our Family Tree are all the descendants of Francis Richey from Ireland and Frederick Smith from Germany. This information is included from the books, "The Decendents of Isaac Ritchie of Virginia" by Vergie Ruth Carr Lantz, "The Origins of the Judge Glenn A. Ritchey Jr. Family" by Glenn A. Ritchey as well as his Supplment and Update and "Descendants of a Hessian Soldier, Lorenzo Frederick Smith" by Goldie Turner May. All the ancestors that tie directly into the Ritchey and Diehl families have been included - all in one place! Other family lines that tie into the Ritchey and Diehl families are also represented. They are the descendants of Isaac Vetter of Germany (Feather ancestry), John Hair and Isabella of Ireland, and Frederick and Christiana Claar, just to name a few. Help Pass on and Preserve Our Family Tree Today! PLACE YOUR ORDER for this CD today and give a gift of our heritage to your family! You can help in preserving our Family History for Future Generations! Included are all of the details on our ancestors, including biographies, notes, pictures, family and pedigree information in an easy-to-use interactive application. Besides the searchable application, all the information is also contained in updated Family Genealogy Books in Adobe Acrobat PDF format. This Ancestry CD program allows you to view and interact with the Family Tree, display individual, family, pedigree, and descendent lists! Find and highlight individuals in the Family Tree and more! The Family Genealogy Books are in two distinct formats. One version allows easy access to each ancestor by clicking on their name and another version is included that displays photos. 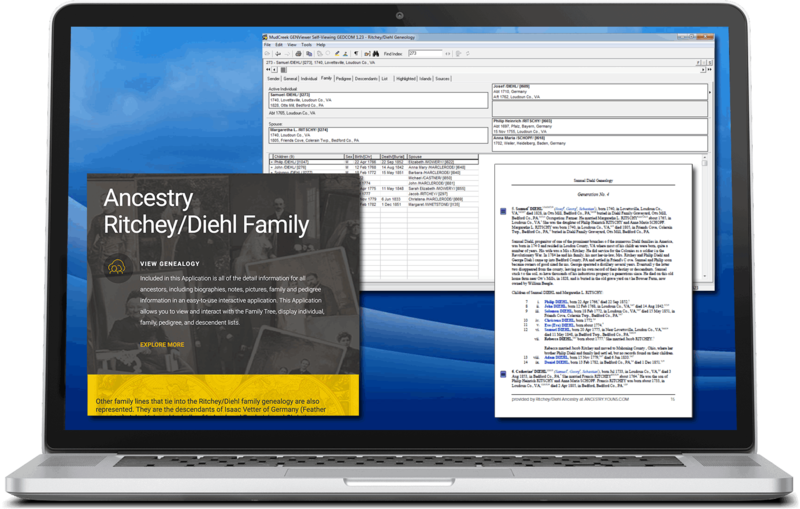 The most resourceful ancestry information in one easy to use application including PDF Geneology Books. Details our ancestors, including biographies, notes, pictures, family and pedigree information in an easy-to-use searchable interactive application. Two distinct formats. One version allows easy access to each ancestor by clicking on their name and another version is included that displays photos. Verifiable source records included. Census images, cemetery records, birth and death records, obituary and marriage certificates to name a few. Photo Albums include not only individual family photos but cemetery photos, historical records and original marriage, birth and death certificates. Additional Family Genealogy Books include "Genealogy of the Descendants of David Ritschy", "Genealogy of the Descendants of Francis Richey", "Genealogy of the Descendants of Isaac Vetter", and "Genealogy of the Descendants of John Hair". Extra books and items include, "Photo Album for Ritchey/Diehl Family Ancestry" which includes Census Images and Cemetery Listings and Photos, and more! As a Special Bonus, included is "An Account of the Family Reunion of the Descendants of Samuel Diehl of Friend's Cove, Bedford County, PA held September 19, 1890", as well as the book published in February 1915, "Diehl Families of America - History, Genealogy, Reminiscences" by E. H. Diehl. This Special Bonus Book Offer includes the genealogy information of 15 Diehl Families with 22 Illustrations! ORDER YOURS TODAY and pass on a heritage to your family! Special Price for the Complete Ancestry CD is ONLY $29.99 plus shipping and handling! If you only want the Updated PDFs without the complete CD they are only $9.99 Each! All orders are through PayPal! You can pay with any major Credit Card securely! Copyright (c) 2018. All Rights Reserved.